Quite a while back, Gmail had introduced the call to mobile phones feature; with which one could call to a phone number directly from your Gmail Account. But the unfortunate thing is, it’s still FREE only to US & Canada users. 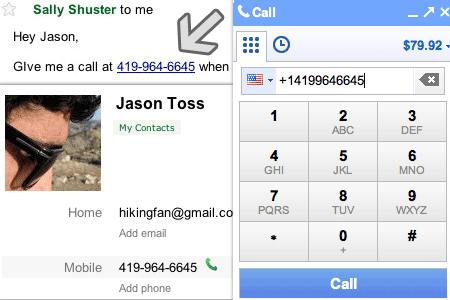 Today, Gmail has added another feature named ‘Click to Call’ in it’s Call function. You might be aware of Skype’s Add-on for browsers which adds a similar functionality. Once you click on a highlighted number, it opens up Skype and starts calling that number. So you’re saved from the time & effort needed to Dial the number & then wait for the receiver to pick it up. Click to Call does more or less the same thing which Skype does. But unlike Skype’s Add-on, it doesn’t highlight the number. Instead to give a professional look it hyperlinks the number. Once you click on the hyperlinked number, the Dial pad will pop-up & the hyperlinked number would be dialled. For all this to happen, you need to Install the Voice & Video Chat plugin. So, let’s take a look on HowTo Install the ‘Voice & Video Chat Plugin’ on your pc. Go to the Google Voice page. Click the ‘Try it Now’ Button. Now, Gmail will start the setup. Be Patient till it gets installed Completely. So, the next time you receive a mail from your Client or a new friend which contains a phone number; just hit the number & the number will be dialled with the help of this new feature. Click to Call has also been added to the phone numbers present in the Contacts page. If you liked this post, then you can Subscribe to Our RSS Feeds / Daily Updates. So have your tried this new functionality added in Gmail ? Do you think the numbers should be highlighted more like Skype’s Add-on ? hope this service comes for India also. It will be great. hey, it has already come to india..
but not rolled out to everyone..
even to those who have got it, it stayed for only 2 hours or less at a stretch..
i called someone once, i must have called to toll free numbers to have experimented.. even a couple of friends said me that they got this feature but only for a temporary cause..
hoping they’ll release it to everyone and in more standard way! Your right mani. But I believe it happen soon. The reason is that US has nearly 66% of population with internet facilites whereas in India it is just 8%. See the smiley face next to your user name at the top of the mail page? Click it – then click Available, Busy, or Invisible. Yahoo! Mail will remember your choice when you return – even if you choose Sign out of chat.